An article (link to the file in PDF format!) published in the journal “Nature Astronomy” describes the first observation of a binary system formed by high mass newborn stars. A team of researchers used the ALMA radio telescope to study a star-forming region cataloged as IRAS07299-1651 where a cloud of gas and dust is collapsing adding materials to two protostars that have similar masses for a total of at least 18 solar masses and must still reach a state of stability. The observations indicate that this pair was born from the division of a single disk of gas and dust and now each of the two protostars is surrounded by its own disk. Binary or even multiple stars are the norm, but despite the great progress made in the discovery and subsequent study of newborn systems, astronomers hadn’t yet managed to find a pair of giant protostars. They’re still forming inside the Milky Way but the regions in which they are forming are far away and this makes it difficult to study them but finally it was possible to observe a pair in the IRAS07299-1651 region, about 5,500 light-years from Earth. Besides the distance, the problem is given by gas and dust that still surround the protostars, which filter many electromagnetic frequencies. The radio waves pass through those materials and the ALMA (Atacama Large Millimeter/submillimeter Array) radio telescope, inaugurated in March 2013, is ideal for that kind of surveys thanks to its power and sensitivity that allows detailed observations. The researchers led by Yichen Zhang of the RIKEN Cluster for Pioneering Research in Japan and Jonathan C. Tan at Chalmers University and the University of Virginia in the USA examined the IRAS07299-1651 region with ALMA and found two high-mass protostars. The image (Yichen Zhang et al., Nature Astronomy. All rights reserved) shows dense and dusty gas flows in green that seem to flow towards the center. The gas motions, traced by the methanol molecule, are shown in blue and red. 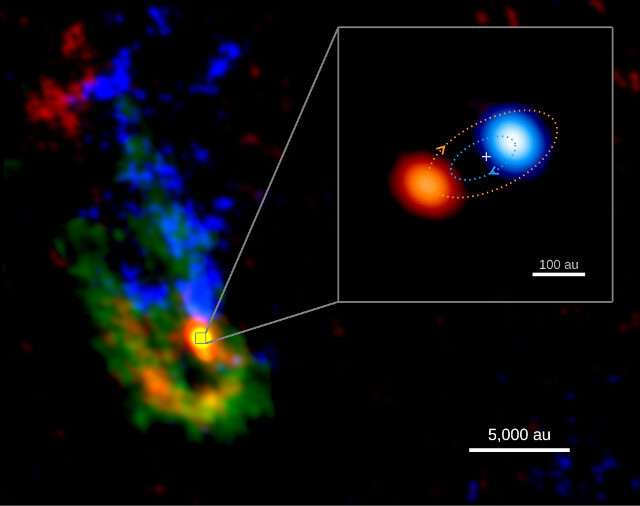 The inset shows a magnified view of the massive binary system in formation, with the brighter primary protostar moving towards us in blue and the fainter secondary protostar moving away from us in red. The blue and red dashed lines show an example of orbits of the primary and secondary spiraling around their center of mass, marked by the cross. This binary system consists of two protostars with similar masses, which could be close to 10 times the Sun’s each. The distance between the two protostars is about 180 times that of the Earth from the Sun and they orbit the center of mass in a maximum of 570 years. One of the questions about binary systems made up of two massive stars concerned their origin: are they born together from the fragmentation of a single disk or are they born separately and then bind gravitationally? This research indicates that at least in this case the fragmenting disk hypothesis is the correct one. Another discovery is that the original cloud from which the protostars are being formed continues to add materials and this allows the secondary one to steal materials from its sibling, the reason why they have similar masses. Jonathan Tan commented that this is an important achievement for understanding the birth of massive stars by reminding that they’re important among other things because they produce the heavy elements that also exist on Earth and in our bodies. Yichen Zhang pointed out that he and his collaborators intend to look for other examples of binary system with massive stars to understand whether the one they studied is unique or a common situation. This type of star consumes its own hydrogen at very high speeds and consequently has a short life in astronomical terms which is a few million years for the stars with a mass tens of times the Sun’s. Astronomers already studied supernovae generated by the explosion of stars of this type, now they can finally study the initial phase of their life cycle as well.